Bregman’s main observation is that governments are the biggest and best innovators because historically they have paid for some people that eventually went on to work on technological breakthroughs. That the government for a while paid a share of the wages of people who would later work on technological breakthroughs does not make the government the innovator. That Abramovich funneled $3 billion into Chelsea does not make him top scorer of the Premier. Following his logic, we might as well claim that the rich are the biggest innovators, as they pay all of a country’s taxes. Next to a logical fallacy, Bregman errs empirically as he is cherry picking. He selects examples, such as ASML, that fit the story he wants to tell. ASML allegedly received some government funding while it was at the brink of collapse. Much later, it grew to become the no. 1 chip manufacturer in the world. Even in this case it is at best a stretch to assign the credits of ASML’s success to the Dutch government. Governments have poured billions and billions into innovation programmes, but just spending a lot of money does not make them great innovators. In the same way that continuously handing out ample amounts of bread in a developing region may prevent a bakery from having actual sustainable success, it is well possible that they cause more harm than good. It is an extreme illustration of the parable of the broken window. You can only judge about the effectiveness of an investment if you consider the opportunity costs. Take the Egyptians. You can marvel at the pyramids and admire the construction ingenuity. But before you declare the Egyptian pharaohs to be the ultimate masters of innovation, do ask the question: Was there really nothing else that all this wealth could have accomplished? Was it really worth all those lives? To be able to draw sensible inferences, you need evidence-based policy evaluations, of the type recommended by Theeuwes et al. (2012). Selecting a number of convenient examples and claiming that governments have been great at innovation policy is logically equivalent to claiming that the Nazis were good for all people based on what he said about blonde-haired and blue-eyed Germans. Unsurprisingly, his considerations lead Bregman to formulate wrong and downright dangerous conclusions. To start off, he claims that governments should invest in highly risky, technological ventures and have a right to claim a direct financial return on these investments. That is about as close as it gets to the definition of public ownership. It is wrong because the government does not have the necessary expertise to be an owner of highly innovative companies. She is dramatically unable to judge the feasibility and potential added value of technological ideas. A: Significant investments are needed that do not immediately yield a profit. B: The investments of A could result in a profit. This profit for the investor – and therefore the surface of B – is highly uncertain. C: The innovation could lead to a profit for society as a whole (‘positive externalities’), for example by raising living standards. 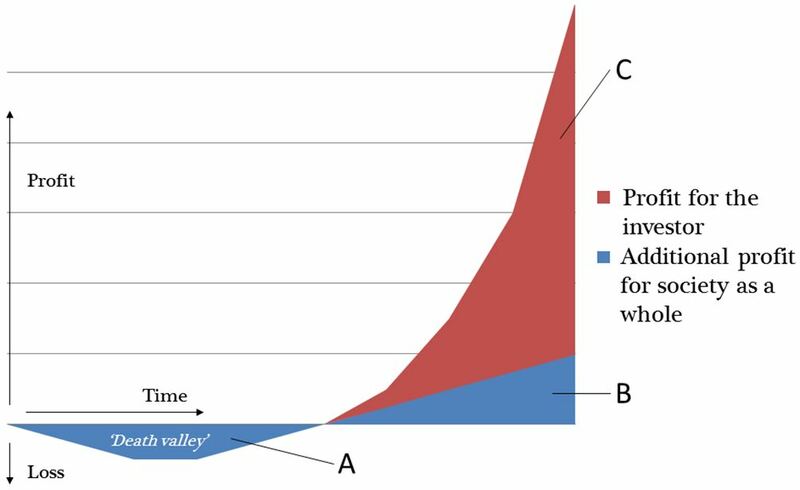 The classical ‘mistake’ of the market is that the private investor does not care about surface C. In addition, a so-called ‘death valley’ may scare him off, resulting in unrealised gains for society. The ultimate trick is to compensate the investor in such a way, that the innovation still comes to fruition. The government should compensate surface A because she is interested in surface C.
So here we can see where Bregman makes a critical mistake. In the case of ASML, a high tech company producing photolithography systems for the semiconductor industry, he wants to cut off a piece of surface B, in addition to the taxes that companies already pay. That is exactly what you should do if you want to frighten private investors. It would set a dangerous precedent. Every company that receives government money, at some point in time, can expect to be fined in case they are successful later. Such government intervention would signal that the government is not there for the people (surface C), but for the money (surface B). Let’s assume that the government would indeed take a share of ASML’s profits without being a legal owner. ASML would immediately suffer from an insurmountable disadvantage compared to their foreign competitors. For ASML the choice would be simple: stay in the Netherlands and perish, or leave and thrive. If this effect would not be adverse enough by itself, then you can be certain that the European Commission would intervene because of unlawful state support. Bregman ignores (or is ignorant of) the crucial concept of incentives. Good venture capital policy is all about getting the incentives right. You want the entrepreneurs and researchers that can make a difference for society as a whole to do exactly that. That means that their creativity should be nurtured and that they should not be constrained by what the government decides to be important. Bregman himself asserts that the iPhone, of all things, is a great example of the innovative power of the government. Do you think for a minute that Steve Jobs, a school dropout, would have been as extremely influential as he has been, if he would have had to align his plans with government plans and discuss it with government officials to obtain funding at every turn? It is even logically impossible: you cannot reasonably plan for something of which you have as of yet no awareness. If governments would indeed take the role of the great financer it would distort incentives in yet another grave way. If you start handing out funding as the ultimate venture capitalist, how do you presume to know what exactly will be the next breakthrough? Exactly, you don’t. What you would nurture, however, is a very particular set of skills: how to get a subsidy as opposed to how to create the new breakthrough. Bregman claims that ‘the government should not wait for the market, but choose a direction themselves.’ This requires the assumption that someone or a select group of individuals is able to absorb and process all relevant signals from the market, and then, to formulate policies that are somehow judged to be optimal for society. ‘It is not the invisible hand of the market that should guide us, but the visible hand of the government.’ It is nothing short of blatant arrogance. Have we not learned anything from the failures of centralised (economic) policy-making? Bregman stumbles on by claiming that most innovative companies come from the U.S. because that’s where the biggest government is located – a claim wrong on so many levels that it is difficult to decide where to start disproving it. If the size of government expenditures is the critical factor, where are the innovative companies in Russia or China? Much more so than their American counterpart are these governments willing to be the influential force deciding the direction of the nation, as Bregman wants them to be. If the size of government spending on R&D is all that matters, why are they so far behind when it comes to innovative firms? It is true that the U.S. government had a huge role in sparking Silicon Valley’s initial success. They are no different, though, in their desire to finance technological progress – all governments want that. What the Americans understood better than everyone else is that you need to get the incentives right. Instead of providing funding to one company and not the other, it is better to invest without distorting incentives. For instance, you can require the entrepreneurs to keep a stake in their own business. Or you can demand that at least 50% of the funding should come from a private party. Or you can invest in an early stage, but give entrepreneurs the possibility to buy back shares later on, at a discount. In any case, the innovator should have a financial stake in the success of the project. This lesson was learned by the Israeli government who did an amazing job in kick-starting a venture capital industry through their Yozma programme. Numerous other factors play a role in explaining the success of Silicon Valley. There was not only the funding, but also the expertise and knowledge through unique highly skilled labour. A well-balanced law protected technological innovators, including strong intellectual property rights. Necessary supporting institutions such as law, accounting, and consultancy firms were available, as well as financial intermediaries with knowledge of venture capitalism and reliable exit opportunities (such as a liquid stock market). The American culture is less risk-averse. On top of that, the social stigma of failure that is associated with bankruptcy in Europe is almost nonexistent in the U.S. The legal consequences of bankruptcy are also a lot milder than in Europe, in part because it is a lot easier to fire people. This encourages entrepreneurship because it reduces the risks in case an innovation is less successful than expected. It is truly unbelievable that Bregman is able to consider Silicon Valley and conclude that it works because the U.S. government is the biggest. Equally unbelievable (and hilariously funny if it weren’t so serious) is his observation that American households have not seen any financial improvement in their situation since 1988. A critical mind would wonder whether we even want to replicate the success of the Americans. Economic success is achieved by creating and exploiting a competitive advantage. Why would you want to beat the Americans at their own game? There is a wide literature showing that European countries are unique in their own ways, that the U.S. would find impossible to replicate. For instance, European countries are much better suited for incremental rather than radical innovation. Implementing venture capital policies in Europe requires more than a casual look at Silicon Valley. Despite all this, Bregman continues to hang on to the idea of a government-steered venture capital industry. Bregman even delights us with a glimpse of the intellectual omnipotence associated with centralised planning when he considers windmills. According to him, it doesn’t matter that despite ample government subsidies windmills have never really turned into a profitable business, because they are supposed to run on government money. … it doesn’t matter that subsidising energy production makes energy cheaper for the consumer and therefore encourages energy consumption. … spending money on windmills is better than focusing, for example, on regulation to discourage or even ban wasteful energy consumptions (i.e. isolation of homes or laws detailing requirements for electrical appliances). … it doesn’t matter that government subsidies for windmills will make every other potential alternative source of energy such as solar power and biofuels less attractive for private innovators and investors. We should be glad to have the likes of Bregman among us, to steer us all through the incredibly complex matters we face. But, then, what should governments do? Keeps the right incentives intact. Government support should be such that the actual innovator has a (financial) stake in the success of his project. Supply-side is at least as important as the demand-side. If ideas are truly good, they usually find their funding. It is as crucial to create and maintain a fertile breeding ground where good ideas can be born and nurtured as it is to have the funding to do something with these ideas. A venture capital market will only be truly successful if all crucial factors are present at the same time. Different authors make different lists of factors (see for example Hellmann, Florida and Kenney, and Gilson). Funding, however, has never been the problem in the Netherlands as Bregman seems to suggest, nor has it been a lack of government commitment. Concentrate venture capital policy efforts and separate them from social policies, often directed at reducing inequities. Venture capital will not thrive in economically backward regions anyway because the other factors, like highly skilled labour and supporting firms, aren’t there either. Venture capital only thrives when the relevant region reaches a certain critical mass (venture capital is not a success in the U.S. – it is a success in Silicon Valley), which is why smaller countries like the Netherlands should concentrate their efforts. Simplicity is key. There are plenty of brilliant technical minds that have no idea how to get support from the government. In my graduation research I found that there had been dozens and dozens of programmes trying to support innovation. Their funds often remained unused because entrepreneurs had no idea how to find and get them. Prevent undercapitalisation. Technological progress takes time. You need to sit it out and be in there for the long term. A few well capitalised projects are preferred to many undercapitalised ones. Reducing capital gains rate is not key. Perhaps one thing Bregman and I agree on. Drop the markets vs. states debate rhetoric. Bregman takes a strong ‘market versus the government’ perspective and argues that one is better than the other. As argued before, such framing is pointless. States cannot sustainably increase living standards without markets (see the consistent underperformance and inequalities associated with central planning, across both time and geography). Likewise, an efficient market cannot exist without a properly functioning state or government. Government can never duplicate the variety and diversity of individual action. At any moment in time, by imposing uniform standards in housing, or nutrition, or clothing, government could undoubtedly improve the level of living of many individuals; by imposing uniform standards in schooling, road construction, or sanitation, central government could undoubtedly improve the level of performance in many local areas and perhaps even on the average of all communities. But in the process, government would replace progress by stagnation, it would substitute uniform mediocrity for the variety essential for that experimentation which can bring tomorrow’s laggards above today’s mean. This entry was posted in Economics, Politics and tagged economics, innovation, politics, public policy, venture capitalism.